I hate to say it, but there are times when I need to access a Windows only program. One of the push backs against Chromebooks is they can’t run Photoshop, or Microsoft Office, or some other platform specific software. While many people never need to run such software, there are some who do. How can they use a chromebook as a main computer? Chrome Remote Desktop allows Chrome to open a remote session on a Windows, Mac, or Linux computer. With Chrome Remote Desktop you can connect to the remote computer and run whatever software you need. I use this to connect, from my Chromebook, to my computer at the office, my old laptop upstairs, and our “family computer” in the dinning room. I can connect to all three computers without leaving my chair! I’ve also discovered I can run multiple instances and use my Chromebook as a “command center” of sorts. Connecting remotely allows me to use all the software I might need. The connection is good and surprisingly fast. I have even done some simple video editing this way, but I wouldn’t suggest doing anything extensive. 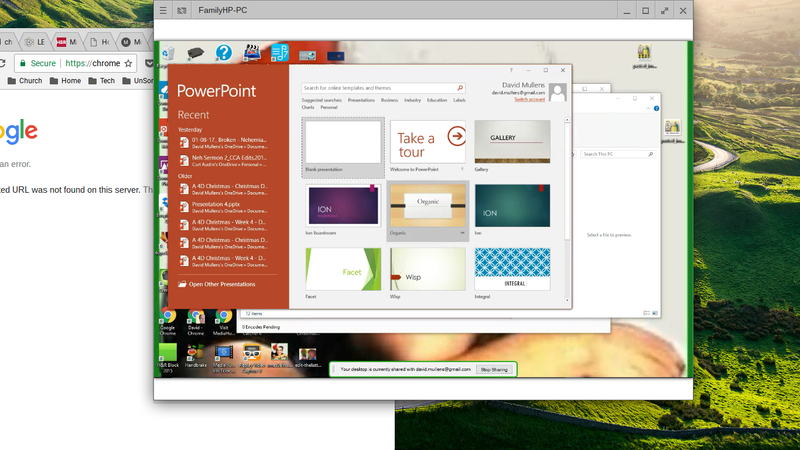 I can use the full version of Powerpoint and my Windows Bible software, Logos, works extremely well. While non-remote sessions are best, having the option of connecting remotely allows me to leave my laptop at work. It is nice not having to drag my work laptop around. Some suggest purchasing a Chromebook for travel instead of taking a $2000 Macbook Pro or higher-end Windows system. Chrome Remote Desktop frees you from sitting in front of a desktop computer as well. Since most of my computing takes place in the web browser, having the option of opening a remote session on my work computer means I have access to almost all the computing I need. The one area where I still need to be in front of one of my other computers is video editing. There are options for using platform specific software…but you will need a separate computer. With some Chromebooks costing under $200 new and under $125 used, why not view the Chromebook as a second computer? Another option for remote sessions would be Chrome RDP which allows you to access a Windows system running an RDP server. This is where things get interesting. 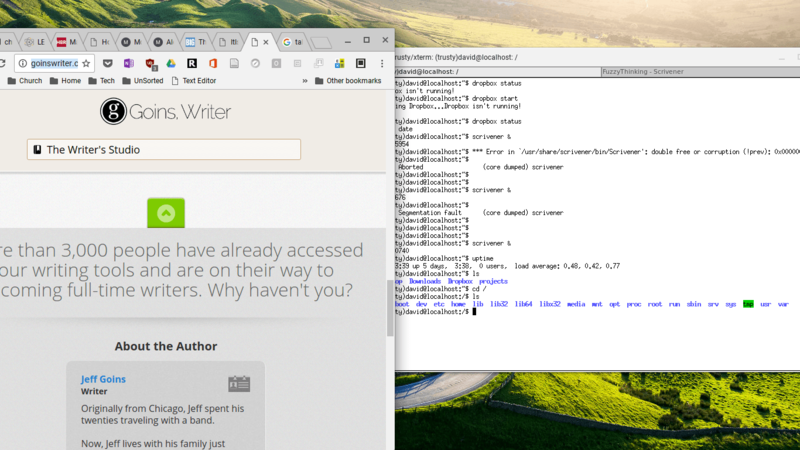 Crouton allows you to install a full blown Linux distribution on your Chromebook. Having Linux on a Chromebook opens up the full power and potential of the system. Photo editing, full office suites, system and administration tools are all available. There are a few issues to keep in mind though. Given the limited resources of most Chromebooks, I’ve tried to stick with a low-resource Linux distribution and Desktop environment. My computer only has 16 Gigs of disk space with 10 usable, so I keep an eye on my disk usage. Having an SD or USB drive helps. I’ve installed Ubuntu with e17 as the desktop environment. I’ll be more specific in my current setup and how I’m pulling everything together below. Currently I’m installing development tools so I can work with NodeJS. Installing Linux allows Web Development (and perhaps other types of development as well) on Chromebooks. Why would anyone want to use a Chromebook to do development? 1) Price, 2) portability, 3) if someone steals your computer, you are out a few hundred dollars. I doubt I would try to do hard-core Java development on it, but Web Development should work fine. Using Crouton to install the Xiwi option for Linux allows you to run Linux in a window panel in ChromeOS. Instead of having to switch between ChromeOS and Linux, you can run Linux in ChromeOS. I didn’t think having Linux run in a Chrome window was that big of a deal, until I started doing it. I love it! For about three years I’ve been running Linux concurrently with ChromeOS. I would use CTRL-ALT-SHIFT-FOWARD and CTRL-ALT-SHIFT-BACKWARD to switch from ChromeOS to Linux and back. Then ChromeOS was updated and when I would switch to Linux I would get a black screen. I was not happy, but I was running ChromeOS Beta, so such issues are to be expected. I didn’t want to switch back to the stable channel, so I searched for solutions. Someone on the Crouton forms mentioned that running Linux via Xiwi still worked. I tried it. I’ve been running Linux that way ever since. 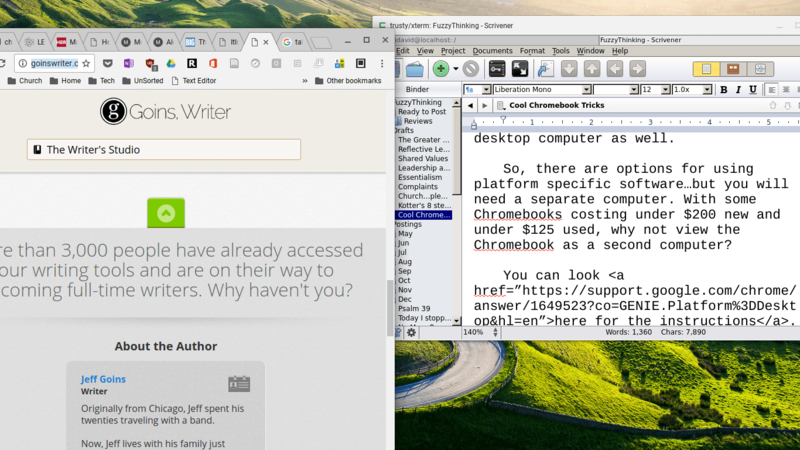 I’m including a screenshot of Chrome next to the Linux version of Scrivener. I’ve been surprised at how well and fast Scrivener runs this way. I use Scrivener for various writing projects. Scrivener works well for long documents like books and other writing projects. Scrivener breaks a document up into sections, like chapters, and has a lot of features that make writing books easier. My short description doesn’t do Scrivener justice. If you do any kind of writing, I encourage you to Check it out here. Officially Scrivener only supports Windows and Mac, but there is an unsupported Linux version that works fine. My original plan was to use Chrome Remote Desktop to connect to one of my Windows machines, but then decided to give the Linux version a shot. I was pleasantly surprised. I cannot relate the wonders of having access to Scrivener on my Chromebook. If I’m in the office, I’ll fire up the Windows’ version. If I’m at home or on the road, I’m usually on my Chromebook, so I’ll fire up the Linux version. Since Scrivener doesn’t use the “cloud” to sync, I use Dropbox to keep files and projects synced. Storing my files on Dropbox keeps my projects in sync no matter what computer I’m using. I’ve installed Dropbox on all my Windows machines as well as my Linux installation on my Chromebook. Remembering to EXIT Scrivener after each session minimizes the potential of having one instance of Scrivener overwriting files from another instance. Scrivener will warn you if you try to save an already open file giving you the option to save a copy. I haven’t had any issues though, but the potential of sync problems is always in the back of my mind. Note: For some reason every time I exit out of Scrivener I get a “Segmentation Fault” and Core Dump. It doesn’t seem to effect anything…and it only seems to happen on exit, so not a big deal, at least to me. My office tends to be distracting, so I do of my work outside the office, which means, I’m on my Chromebook. I have Linux installed (I’m using e17 which doesn’t take up much disk space), with Scrivener and Dropbox, using Xiwi. I begin by running an Xterm shell in a window in ChromeOS. I start the Xterm, then start Dropbox, which keeps my files synced. After I verify that Dropbox is working by the “dropbox status” command, I fire up Scrivener. I love working in Scrivener via Xiwi. I no longer have to switch back and forth between Linux and ChromeOS. I have the best of both worlds! If I need to access the full version of Powerpoint, or access my Bible software I start a Chrome Remote Desktop session. ChromeOS continues to evolve. With the introduction of Android Apps (see, I didn’t even have to mention those) a whole new set of tools are being added that can continue to take ChromeOS beyond the browser.